I know, some people really don’t like subscriptions. I get it. But sometimes the value proposition is compelling. For many people (me included), paying $9.99 for a month of Netflix beats buying a movie on iTunes for that $9.99 (or more). It’s the same with Spotify or Apple Music — you can play a lot of music in a month for the same price as purchasing a single album on iTunes. Setapp for Users — That’s part of the pitch for Setapp, a new subscription service from MacPaw that gives Mac users access to 60 carefully curated apps today, with more coming in the future. Pay $9.99 per month (the first month is free) and you can use any number of those apps for no additional charge. Nor will the price go up as more apps are added. It’s unlikely apps will be removed often, if at all, given that developers sign a 12-month non-exclusive agreement. Setapp automatically keeps its apps up to date at all times, so you don’t have to fuss with installing updates — including major new upgrades. These apps aren’t demos, crippled, or older versions, and there’s no advertising anywhere. You can even use Setapp on a second Mac merely by signing in on that Mac. Obviously, the question comes down to whether you’ll use enough of the included apps to make the subscription worthwhile. Let’s say you want to write in Ulysses ($44.99), create Web pages in RapidWeaver ($99), take screenshots with Capto ($29.99), keep track of your Mac’s performance with iStat Menus ($18), and monitor your server with Simon ($99). You’d pay nearly $300 to buy all that software, or you could subscribe to Setapp for 30 months for the same price. Those are all fine apps, and while I’m not familiar with every app included in Setapp, those I do know about are solid. 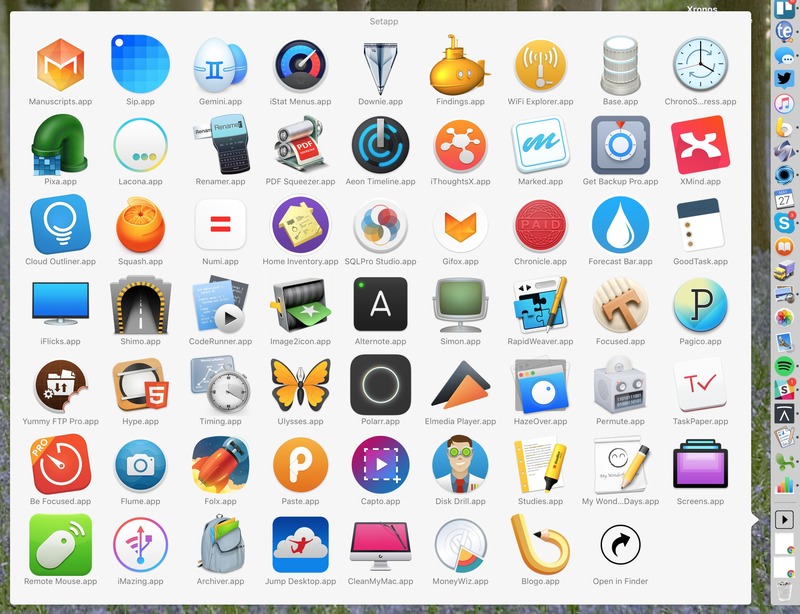 MacPaw is selecting which apps get included in Setapp to avoid overwhelming users with too many similar choices. You can browse through the full list of current apps, and as I said before, more will be appearing soon. It’s also worth considering that Setapp includes some apps, such as MacPaw’s own Gemini duplicate finder, that you may want to use, but so infrequently that you can’t bring yourself to buy them outright. Gemini costs $19.95; I’m not sure I’d buy it for a couple of uses per year, but I’d be happy to have access to it in Setapp. I could even see some people subscribing to Setapp on and off as a way of testing apps that they might later purchase. There is another potential benefit to the subscription approach. 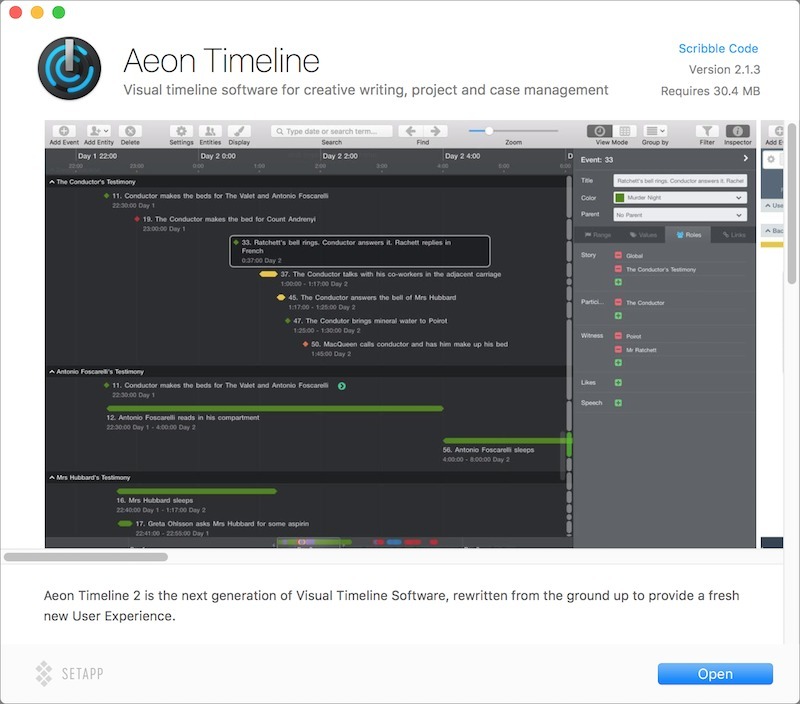 Matthew Tobin, developer of the included Aeon Timeline, said he was excited about how Setapp’s model overcomes a flaw in the standard version-based licensing approach. Version-based licensing stifles creativity. Developers are forced to choose between creating paid upgrades, which delays feature releases, and free updates, which discourages investment to improve apps. If users embrace subscription models, both sides are better off: developers will be rewarded for improving their app for the long haul, and new features will be in users’ hands faster instead of held back for artificial milestone releases. Using Setapp — Working with apps in Setapp is simplicity itself, since it integrates right into the Finder in OS X 10.10 Yosemite or later. MacPaw has a good video overview. Once you’ve installed Setapp and signed in, a Setapp folder appears in your Applications folder and adds itself to your Dock and Finder window sidebar and toolbar (you can remove it from any of these locations if desired). You also get a Setapp menu in your menu bar; it provides access to a few preferences, most notably the presence of the Dock icon and a search shortcut I had to change because it conflicts with LaunchBar’s Control-Space. Inside the Setapp folder are “teasers” for all the apps — they’re only about 2–3 MB in size. Double-clicking one doesn’t launch the app itself, but instead opens a window that describes the app in detail, complete with screenshots. Click an Open button in that window and the app downloads and launches. From then on, it’s a normal copy of the app. This teaser approach is smart, since it eliminates the need for any additional interface and lets you save space. Setapp itself takes up about 110 MB, and the stub apps occupy another 300 MB, but an app like RapidWeaver would be nearly 90 MB on its own. If you install an app you don’t want to use, you can delete it, after which Setapp will revert it to its teaser state. You can even remove the teasers too, and get them back by choosing Restore Hidden Applications from the Setapp menu. I find that the Setapp app list on the Web is actually a little better for browsing through apps that you’ve never heard of before, since it provides a quick description when you mouse over the app’s icon. Note that Setapp’s Dock icon regularly changes to focus on different apps; that has made me curious enough to open a few teasers for apps whose icons I didn’t recognize. Setapp for Developers — The next question about Setapp is if it’s a good deal for developers — should we users worry that subscribing to Setapp will result in reduced revenues for the developers we want to support? No one knows the answer to that yet, but here’s how Setapp works for developers. First, developers get 70 percent of all revenues, with MacPaw retaining the other 30 percent. The developer share of the revenue is distributed based on the number of apps each user launches in a month, with the actual amounts calculated as a percentage of the list price of the app. So let’s take the sample set of apps I mentioned above and see how that breaks out (with round numbers). Of a single user’s $10, $7 goes to the developers and $3 goes to MacPaw. That $7 is distributed among five apps that cost $291 proportionally by list price, broken out into 17 price tiers with individual multipliers. Assuming I’ve understood MacPaw’s documentation right, each app in this example would earn about 30 percent of its list price in a year. The more apps you use, though, the less each developer will earn. To grow the user base and reduce developers’ reliance on application revenues, MacPaw also pays out a 20 percent partner fee (from its 30 percent). For each user who signs up for Setapp from a particular developer, that developer receives 20 percent of that user’s payment ($2) each month as long as the user continues to subscribe. That could significantly increase revenues for developers, and it incentivizes them to direct customers to Setapp along with providing normal license sales. My position on it is somewhat experimental. We joined Setapp to give customers a choice and to see how it works for us, but I certainly don’t intend to adopt it as my only way to connect to customers — we will continue to support direct license sales as our primary channel. I thought it could be a good means of marketing and extra revenue. I’m excited for the launch, and looking forward to seeing how well it does. It seems like a very useful service and elegant implementation, so I am hopeful it’ll be very popular with Mac users, and help more of them discover Dejal Simon. I think it will bring us a lot of new users that we could not reach before so overall it will be a financial gain. The Setapp model makes perfect sense for a lot — if not the majority — of people. What some people don’t seem to realize is that the collection of software is not static. They intend to grow it to at least 2–3 times the current size. The current offerings are good but there are gaps that should get plugged over time. The main upside I see is exposure to potential new revenue from casual users — i.e. the kind of people who might use the app a few times a year when they need to perform a particular task, but won’t use it often enough to warrant purchasing a license for $50. The success of the platform in that respect will depend on how well Setapp manages to market individual apps and encourage users to explore all of the apps on offer. If users don’t know what they are paying for (especially if the platform grows too big), they won’t know to look for and use our app when it would help them, and that casual income stream would dry up. The most obvious potential downside would be if participating in the platform undermines baseline license sales — but I hope the markets are sufficiently different, or that remuneration from repeat users is not too dissimilar to a license sale (this depends on how many apps users normally launch). MacPaw is currently adding products to Setapp mostly by invitation, so if you’re a developer, probably the best way to join is to talk with another developer who is already participating to see if they can help you get an invite. You can also contact MacPaw to make sure they’re aware of your product. Brave New App Store — Since Setapp offers the first month free, there’s no downside in signing up and giving it a try. If you don’t find yourself using enough of the apps, it’s easy to cancel your subscription at any time. Regardless, kudos to MacPaw for having the gumption to try something new, particularly in a world that includes Apple’s Mac App Store. But since the Mac App Store hasn’t universally delighted users and developers, there’s room for Setapp. I wish a similar service existed for news articles. I'm willing to pay for the things I read, but I cannot afford subscriptions to all the news sites I read things from. I _have_ a subscription to a thing called Blendle that goes part of the way (you can read individual articles in a number of publications, mostly Dutch but there is a couple of US titles too, such as the New York Times and the Washington Post). The problem with their approach is that they seem to aim to create a sharing site where you get suggestions based on what other people read, which is what I don't want to participate in. What would be nice is to have some neutral intermediary that does the bookkeeping for us or that proposes some sort of catch-all subscription. Yeah, I know what you're saying — what you want is almost a personalized clipping service. I've not heard of anything that quite matches. A lot of businesses are fond of latching onto other businesses without adding anything very much of use or value. I prefer to buy from suppliers that offer original products. I agree rhat Setapp is useful for checking out different apps but many of the apps don't offer that much - also I have a few of them already - so the subscription isn't worth it. Also, those us whose native currency is not the US dollar encounter exchange rate issues. I don't think "latching on to other businesses without adding value" is a fair assessment of Setapp at all. The 60+ apps in Setapp are all there voluntarily, and one developer I talked to was excited to participate in part because he'd been considering setting up a subscription to his app, and now he doesn't have to do all the setup work on his own. Besides, the value is discoverability, which is huge to developers. If the Setapp membership gets large enough, it could introduce a lot of users to an app. Finally, it's important to note that the apps may not offer you that much, such that the subscription isn't worth it for you, but everyone has different needs, so it may be instantly worth it for someone else. Movies and TV shows come and go from services like Netflix all the time. Is there an app guarantee for this service? The last thing I want to start paying for is a service where I start relying on several apps for a daily workflow, only to have those apps disappear from the service a year from now without warning or notification. MacPaw tells me that developers sign an agreement to keep their apps on Setapp for a minimum of 12 months. So while it is possible that an app could disappear, it seems unlikely. If things are going well, the developer will want the revenue, and if Setapp isn't doing well, there wouldn't be enough cannibalization to encourage the developer to drop out. It very well could be (and I expect it's very likely to be) true that the usual version-based licensing "stifles creativity" because it "discourages investment to improve apps." An alternative is that giving developers a monthly source of income reduces their incentives to innovate---makes them less 'hungry', some might say. It would be interesting to read further discussion of data (anecdotal, qualitative, or quantitative) on which hypothesis wins out in practice. An interesting question indeed. Adobe would be an example of a company that has gone all-in on subscriptions (with Creative Cloud), though most other developers haven't had the opportunity. I tend to think that whether or not this would be true would vary from developer to developer, based on what motivated them to start. Agreed on variation among (user types and) developers. Creative Cloud is an interesting case. Ah, another big example: Office 365 is Microsoft potentially finally taking off---after several previous tries---with subscriptions in the consumer sphere? Or is it just corporate, still? Conjecture: the more business-y (small or large) the user base is, the more Feasible the subscription model. (i) Naturally annual or monthly budgeting. (ii) More interested in sustainable software development support.